When I first went back to tabletop gaming, one of my players asked if we would get tavern music in taverns, like a previous GM of his had done it. At that point, I had never really used music to enhance the gaming. The first session, I put on the Game of Thrones soundtrack. Then I read about Syrinscape being presented at the Spiel 14 in Essen, and my curiosity was piqued. I’ve been giving it a spin since our second session, and am really quite happy with it. So what exactly is it? 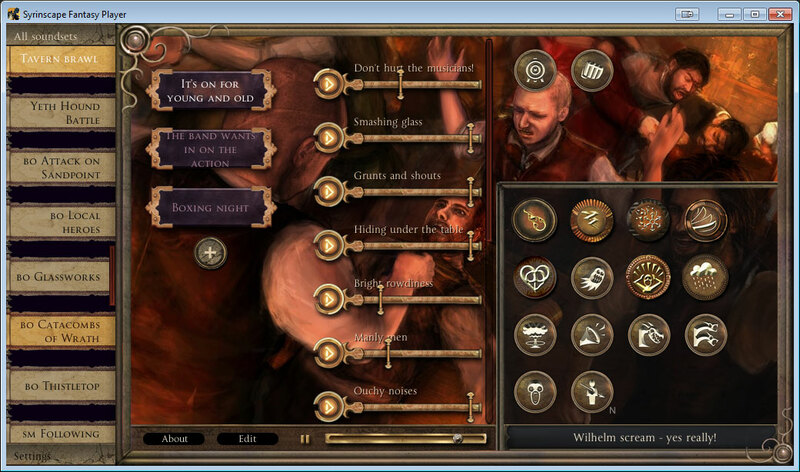 It’s a sound player for enhancing RPGs, available for Windows, Mac, Android and iPad. The mobile part is important to me, because the vast bulk of truly interesting RPG apps is still limited to iPad. The player comes in two flavors: fantasy or sci-fi. The basic version is free, but only comes with two soundsets: Bugbear Battle and Witchwood. The first one is obviously your battle archetype, nicely showcasing the features. You get lots of angry bugbears, riveting battle music to inspire, clanging weapons, etc. The second free soundset is a spooky forest, including rain and creepy nightsounds. If you are interested, I recommend checking those two soundsets out. I play with a laptop at the table, because I run Hero Lab anyhow, and thus also use it to set the music. 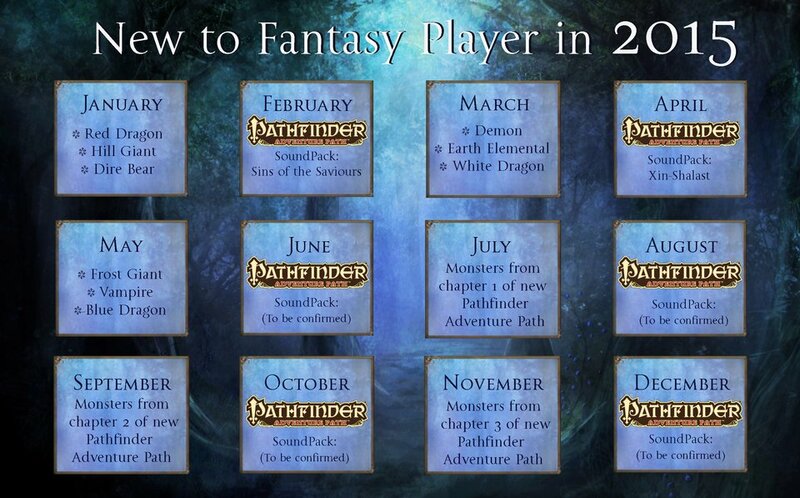 Syrinscape was of particular interest to me after test-running those free soundsets, because it has official Paizo support and actually publishes soundsets for the Adventure Path we’re playing. This is exciting, because it means lots of fantastic sounds custom-made for what we’re playing. That’s what Syrinscape looks like in action. But now, how does it really work? If you look at the screenshot above, you can see the four columns that matter. On the left side, you have all available soundsets. If a soundset is yellow, you have actually downloaded it. Next to that is the list of different pre-sets. I am currently prepping for the Catacombs of Wrath for the next gaming session. There are pre-sets for pretty much all the major scenes in that dungeon. The middle column lists all the different available sounds in this soundset. All the lit up ones are active in the current pre-set. If in the example, you want Erylium to hiss more loudly, but be angry less, you can adjust the volume sliders to your liking. You can also turn off sounds. Let’s say that all sinspawns are dead, only Erylium is alive, then it only makes sense to turn off all the sinspawn sounds with one click. In order for the sound loops not to get entirely repetitive, each sound is on its different loop, and so the pre-sets don’t actually get acoustically boring. You can also create your own pre-sets. Assume you want to create your own encounter using the sounds of a soundset, you just click on the + button and create away. The final column on the right has a lot of preset sound effects. They recently added new ones, which I am very excited about. There are sound effects for fire and lightning spells, you can use somewhat funny Oooo and Aaaahh sounds, you can sound the defeat and play a victorious fanfare at the end of the battle. All of these extra effects have shortcut keys, so you can quickly insert them into a battle. Running battles as a GM is tedious enough at times, so that I appreciate an easy way to insert special effects. The variety of available soundsets is quite huge. As far as Rise of the Runelords goes, they’re up to book 4, which should have me set for at least the next 2 years, with the snail pace of our campaign. There are lots of other sounds as well. From sounds on the streets of a town, to spooky ruins and dungeons to tavern brawls, there’s a lot going on there. For those more on the creative end of things, the Syrinscape Sound Creator was just released as well, so people can add their own sounds and create soundsets. A recent new feature that I am a fan of is the campaign manager. The list of available soundsets is quite huge, especially if you are a subscriber (coming to that in a moment), which means there’s a lot of scrolling and searching involved. That’s why I was quite happy that they just recently added a campaign manager. 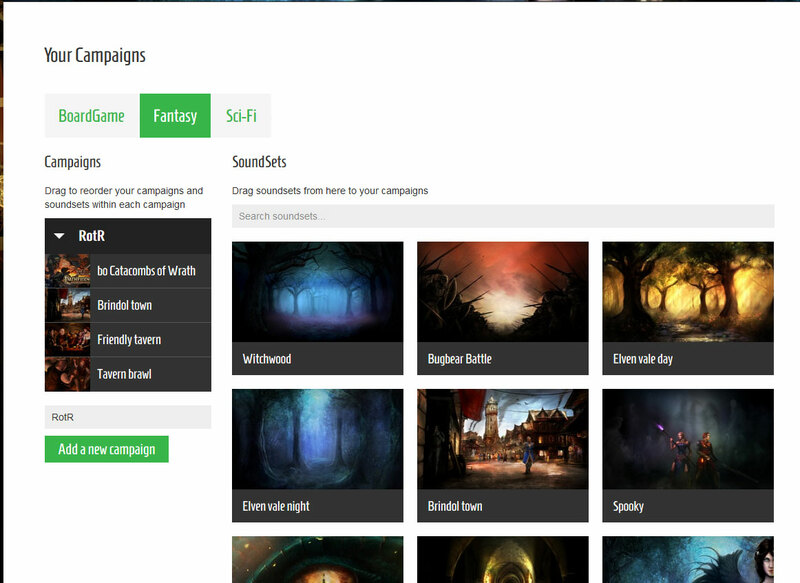 You go to the website, pick My Campaigns, create a campaign and then add the soundsets you want to use for it. You can edit the lists easily. 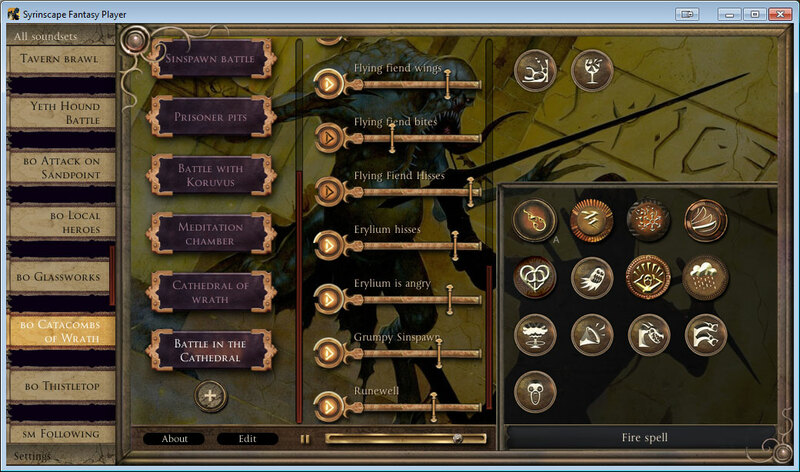 In the player, you can then pick your campaign and it will only list the soundsets you picked on the site. Very neat! Which takes us to the pricing. As the player itself is free, there’s got to be some costs somewhere, and that’s for the soundsets beyond the two free ones. The Syrinscape site has a store where you buy the soundsets. The soundsets for an Adventure Path book is 15.99 USD which isn’t cheap, especially if you have every intention of playing all six books. There’s two starter packs of generic fantasy sounds for 20.00 USD each. Individual soundsets run 3.99 USD. The second option you have is a subscription, and that’s ultimately what I opted for. The subscription is 6.50 USD a month, giving you instant access to all available soundsets. If at any point you unsubscribe, you still get to keep the most current AP release, and all the soundsets that were newly released while you were a subscriber. The current release schedule is three new soundsets every odd month, and in even months you get a new AP book. All in all, that seems like the much better deal for me, and thus, I am a subscriber. Nothing is perfect, and so I have a few issues with the software. Moving it from one monitor to the other causes really weird flickering and makes buttons unresponsive. Downloading soundpacks takes very long. I assume the files are hosted somewhere in Australia, but it would be nice if files downloaded faster. Probably the worst bit for me was the recent update of the software. I had tediously downloaded all soundpacks, only to find that after the update they were all gone again. Not sure why that was necessary. To end on a very positive side, the author, Benjamin Loomes, is a fun guy who does a great job advertising the software. He has a YouTube channel, where he showcases recent additions to the software, lots of demo sounds and for example stuff on how to set up Syrinscape at the table. I will definitely try to see if I can get my hands on a Boombox as the laptop speakers just don’t cut it anymore. He’s also very approachable on Twitter, where I recently asked for advice looking for specific sounds. All in all I think it’s a great product with tons of potential, and it’s really well received in my group. In my recent session in the Glassworks, I feel it truly enhanced the exploration when they were able to actually hear the goblins smashing glass in the furnace room.